Has anybody used TPU with the Delta? Does it work well? Does hte Flux delta+ have Bowden or Direct Drive? Set your print bed temperature to approximately 70°C. Bowden type extruders are not ideal for printing flexible filaments. Your extruder should support the filament between the exit of the drive gear. to the entrance to the melt chamber. I’ve printed with full (not semi) NinjaFlex before, but I had to design my own extruder. I don’t think the original FLUX extruder would be up to the task, but the improvements listed for the new one sure sound promising. FLUX Delta & Delta+ use a Bowden Extruder. 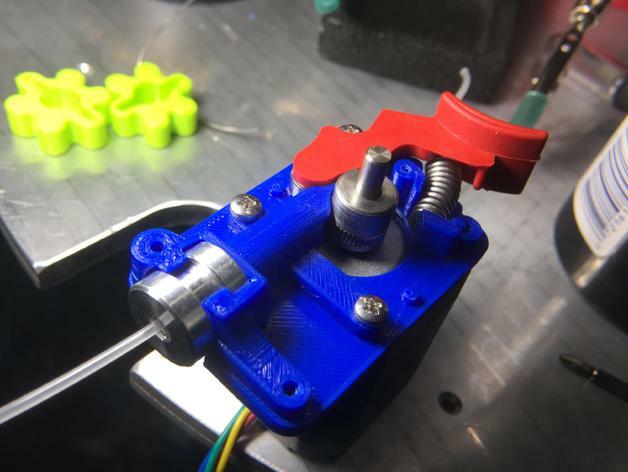 In simplified terms, a Bowden is separate from the Hotend (Nozzle Assembly) and a Direct Drive is mounted directly inline on top of the Hotend. The advantage of a Direct Drive in printing flexible filaments is that the filament makes a straight shot (do not pass go) from the extruder right into and through the hotend. With a Bowden, there is a distance to span, through PTFE (aka Teflon) tube, which can allow the flexible filament to wad or bunch up. I believe a few folks have managed printing flex with the FLUX by turning retraction OFF and printing very slowly. This means the filament is only moving forward, and at a very slow rate, so the idea is that the ‘bunching up’ is avoided. If you can eliminate that, then there is no other reason the FLUX can’t do it. The next logical question is: why aren’t all printers using Direct Drive? Because for this one advantage (ok, maybe a couple others too), there are a LOT of disadvantages, especially on delta style printers. Namely, weight. The more weight hanging out on the effector (hotend, nozzle, cooling assembly, aka printhead) the more pronounced any little wobble is going to be. The whole ‘object in motion tends to stay in motion’ theory comes into play and print quality takes a nosedive. The stepper motors all have to work that much harder to move everything too. So the elegant solution was to separate the extruder from the effector. But it sounds like the new extruder on the Delta+ and the upgrade for the Delta has been redesigned to deal with some of the issues. There has been a common shift in the industry toward a slightly different design to better handle flex filaments, but we will have to wait and see what FLUX Team has done. In general, Bowden extruders are much more common these days, just as 1.75mm filament has mostly pushed out 2.85/3mm filament. Direct Drive still out there, and so is fat filament, just not as common anymore. PLA is definitely pushing on ABS now too, and a lot of other filaments coming in every week it seems. And not all extruders (direct drive included) are up to the task. As soon as your extruder motor has contacted the filament and put it under “pressure”, the filament has to be completely enclosed and constrained or else it will bind and jam. It’s kind of like pushing that yarn through a second straw with an air gap in the middle. An extruder design that doesn’t have any gaps or voids between the drive gear and the bowden path is crucial. Here’s the one that I designed. Wow, Thank you all for the excellent answers! Jim’s design or something really, really similar is pretty much what I am starting to see popping up all over the place. There’s even a name attached to it now, but I’m drawing a blank at the moment.